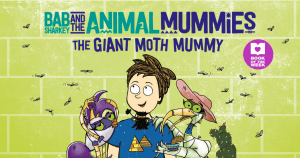 Authors Andrew Hansen and Jessica Roberts are back with another hilarious adventure for the youngest Pharaoh in history, Bab Sharkey, in the second instalment of the Bab Sharkey and the Animal Mummies series. 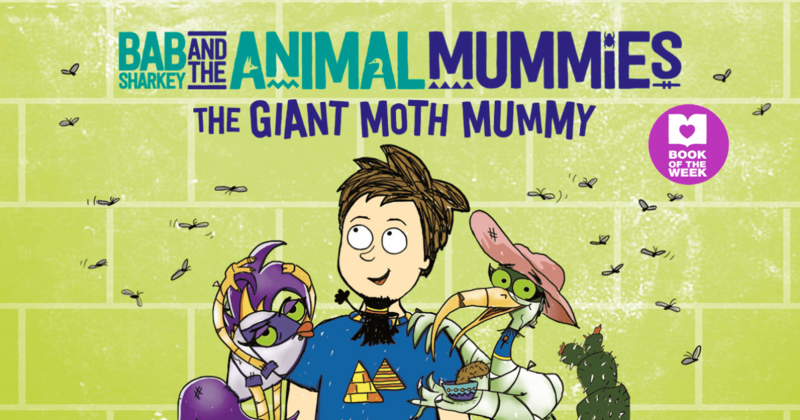 If you’re not familiar with the first book Bab Sharkey and the Animal Mummies: The Weird Beard that was released earlier this year, then by all means read our review (we loved it!) here and you can also listen to a podcast that we recorded with them at the time here. In the meantime, it appears that trouble is once more brewing in Mumphis the lost city of animal mummies and it’s no surprise that the Unpharaoh and her loyal offsider Cainus a jackal (the only remaining one) are behind it – along with a giant mummified moth. In an unexpected turn of events the Unpharoah has managed to perfect the rare art of possessing people, animals and in this case, a giant moth in order to wreak her vengeance on the animal mummies and Bab Sharkey. Her ultimate aim is to reclaim the beard and rule again. Just to fill you in if you’re still to read the last book – the beard is magic and essential to being a Pharoah. It jumped on Bab’s chin unprompted in the first book and things went from there. The beard can transform itself into just about anything that Bab needs it to – which as you can imagine, is very handy. However, can the beard handle a giant moth mummy that is possessed by the extremely evil and powerful Unpharoah? Will the moth manage to eat all of the residents of Mumphis before she is stopped? You can be sure that this series isn’t like any other you’ve read before and you can also be guaranteed of a good laugh with comedian Andrew Hansen as part of the writing duo. This book will certainly spark little imaginations and might even make them go and look up a few facts about Egypt and mummies – and that can only be a good thing. 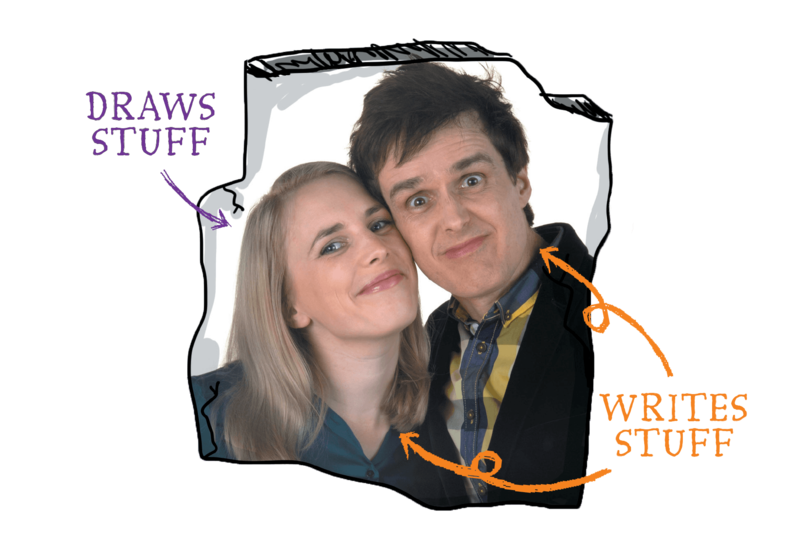 Jessica Robert’s line drawings are a large part of the story and add so much to the humour, if you find it hard to picture a mummified ibis with an upside-down head then you’ll be very pleased to know that this and so much more will certainly grab the kid’s attention. There are an intended four books in the series by husband and wife duo Andrew Hansen and Jessica Roberts and 8+ readers who love action, laughs, Egypt and weird stuff will eagerly devour this and be waiting for the next two. Who knows what goes on inside the heads of this highly imaginative couple – one thing for certain, there must be some very interesting discussions at the dinner table! Andrew Hansen is a comedian, actor and musician, best known as a member of Australian comedy group The Chaser, whose TV shows include Media Circus, The Hamster Wheel, The Chaser’s War On Everything and CNNNN. Andrew’s radio work includes shows on Triple M as well as composing and starring in the musical comedy series and album The Blow Parade. On stage Andrew composed and starred in the musical Dead Caesar, did two national tours with The Chaser and two national tours of two-hander comedy shows with Chris Taylor. In print he wrote for the humorous fortnightly newspaper The Chaser, eleven Chaser Annuals and The Chaser Quarterly. He has contributed short stories to Best Australian Comedy Writing and Journey Through Humour. His debut children’s book, Bab Sharkey and the Animal Mummies: The Weird Beard, was released in 2018 by Walker Books Australia. Jessica Roberts writes, draws and films stories. She has a Bachelor of Visual Arts and Design, and a Foundation Diploma in film studies. Originally from Kyneton, Victoria, Jessica grew up surrounded by an odd collection of pets including dogs, quails, chickens, sheep, goats, rabbits and a donkey. Her stories often involve animals and she uses her childhood memories of growing up in the country as a bank of ideas for storytelling. A trip to Egypt in 2009 inspired the idea for her first book, Bab Sharkey and the Animal Mummies: The Weird Beard, released in 2018 by Walker Books Australia.